Thank you to 2600, and all our donors! 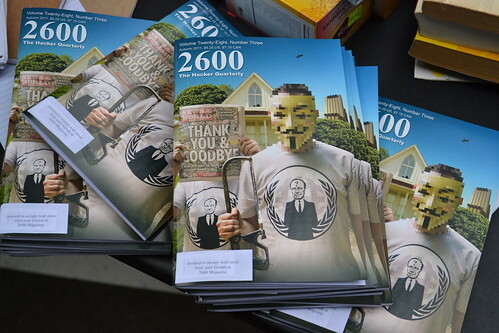 2600: The Hacker Quarterly dropped off some magazines and books the other day. Thank you to publishers like these folks who are stepping up to support us! Yesterday we also received some amazing books from WBAI, and wonderful boxes from donors across the country and authors bringing us copies of their books. Check out our Flickr group for photos of incoming book inscriptions and notes. Going forward I hope we can photograph and post as much of this as possible. I’ve been talking to the awesome folks at 2600, and today they have put out a call for technology donations to our library. I’m really excited about this collaboration – if the occupation of Liberty Plaza is anything, it is first and foremost a hack.